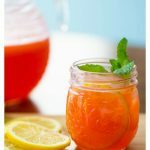 This easy strawberry lemonade recipe is perfect for kids to make for a lemonade stand. It’s the perfect way to have a taste of summer all year long. Set out the pitcher you plan to use for your lemonade. Rinse all the lemons and pat them dry with a towel. Cut one lemon in half at a time using a butterknife. Squeeze the juice from the lemon into a liquid measuring cup. When you’ve got the juice from both halves, cut the next lemon. You only need 1 cup of lemon juice, you may not need all 5 lemons if they are extra juicy. Save the rest for garnish or another recipe. Remove any lemon seeds from the juice with a spoon. Pour the lemon juice into your pitcher. Measure the sugar and add it to the lemon juice in the pitcher. Stir them together with a long-handled spoon until the sugar dissolves. Rinse the strawberries under cold water and drain them. Cut off all the green tops with a butterknife and place the berries in the pitcher of a blender. Put the lid on the blender and then puree the strawberries until smooth. You might want to ask mom or dad about which button you need on your specific blender. Help your child to pour the strawberry puree through a mesh colander into a small bowl to remove the seeds and pulp. Add the strawberry puree to the pitcher and stir to combine. Measure and add 3 cups of water and stir. Store covered in the refrigerator until serving. Garnish with fresh mint leaves if you like.